Note: There are a variety of mini-lessons and activities contained in this lesson on suicide prevention and awareness, so be sure to read through to the end of the page. You may wish to invite your school counselor to your class, and let your administrator know you are teaching about suicide. Let your students know that if they are having thoughts of suicide, they may go to SpeakingOfSuicide.com/resources or call the National Suicide Prevention Lifeline at 1-800-273-8255 (TALK). It may be the case that your class, for whatever the circumstances, is not the right place for this lesson. However, you may still find it helpful for your own understanding of suicide to read through the lesson. Also, take a look at the federal government’s SAMHSA guide to suicide education here. Directions: Read the summary first, watch the NewsHour video, and, if time permits, the Facebook Live featuring Education Week’s Lisa Stark, school social worker Monica Belton and Laura Mayer, director of a suicide texting hotline. Some students may find it easier to follow along using the transcript. Then answer the questions below with your class. Follow up with students the next day and remind them of the names of their school counselors and office location. According to the Centers for Disease Control and Prevention (CDC), suicide is now the second-leading cause of death for ages 10 to 18, and the number of teens reporting feeling sad, hopeless or suicidal has risen. But experts say suicide is preventable. Communities and schools across America have started to talk about suicide more in recent years, which helps take away the stigma. Families, friends, peer support groups, lawmakers, advocacy organizations, and schools are addressing the needs of young people and letting them know that help and support are always close-by. Even when it feels like that may not be the case, there are people out there who understand. 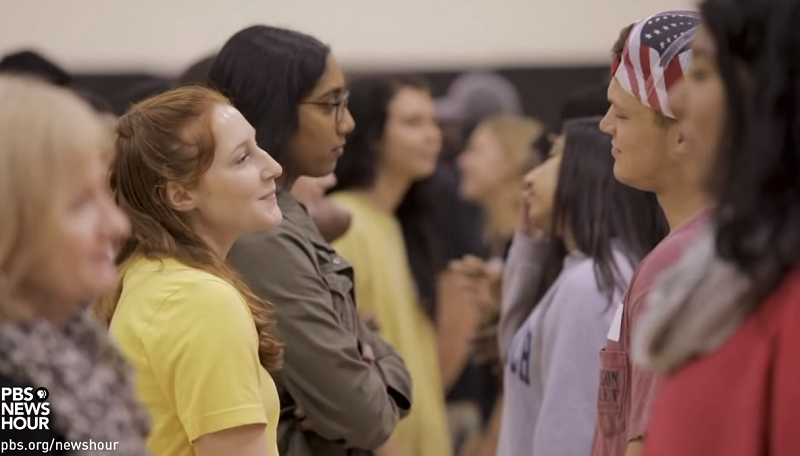 Special correspondent Lisa Stark of Education Week reports on how one Virginia high school is confronting the problem. 1. Essential question: Why is it important for young people to learn about suicide prevention and awareness? 2. Watch the clip below from the story. Keep in mind that Molly has never tried to hurt herself, but she says she hit rock bottom in 11th grade. Young people may have thoughts of suicide without having a mental illness and Molly is a good example of that. What are some pressures teenagers face every day? How might it help you and other students to talk about those pressures? 3. Watch the short clip below from the PBS news story by Education Week’s Lisa Stark. What type of awareness and support does your school have in place to teach students about mental health and suicide? 4. Watch the short clip below from the PBS news story by Education Week’s Lisa Stark. Why is it important to talk with young people in a real, genuine way when talking about suicide, to not “beat around the bush,” as social worker Monica Belton says? Why is it helpful and necessary to have trained social workers and counselors work in schools? 5a. What is the best way to learn how to talk about suicide? Keep in mind that for a long time, and even at present, adults and young people — for a variety of reasons — do not feel comfortable discussing suicide. What might change people’s attitude towards talking about suicide and lessen the stigma around the issue? 5b. Dig deeper: Knowing how to talk about suicide is an important topic in and of itself, according to Laura Mayer, PRS CrisisLink director. She and others in the mental health field have had training on how best to do this. If you know the appropriate language to talk about suicide, think about how you can gently share that knowledge with someone else. It’s a good idea to not make others feel bad that they may have not chosen the right words at the time. For example, it’s often helpful to use the word “awareness” in addition to the phrase “suicide prevention,” says Mayer, because those affected by the tragedy of suicide may feel like they are responsible in some way for not preventing the death of a loved one. It is best to avoid feelings of blame related to the tragedy of suicide, because the issue is far more complicated than one person. There are techniques we can all learn in order to help others who may be at risk. Keeping this thought in mind that one should never feel responsible for another’s suicide, watch the Student Reporting Labs video below and answer these questions: Can you think of an example inside or outside of school where someone reached out to you and it meant something special? Even a little gesture, like saying “Hi” to a peer in the hallway. What about a time when you did that for another person? How did it make you feel? If you are teaching a unit on suicide or mental health, you may wish to break up the video over a few classes. Also, think about stopping the video in between questions in order to help students process the content. As a class, have your students add questions or comments to the Facebook Live discussion. Did you know that most people watch Facebook Lives after they are recorded, so they can still be used as a vital resource. To be sure we have seen your question/comment, send us an email at [email protected], letting us know your user name and that you have responded. “So my car ride home thoughts were…. The main message I’d love to get across is that Suicide Prevention is not a unique action to be handled by one part of a community. Communities are built on humanity and compassion and connectedness: all things that prevent suicide. If we all take responsibility, get involved and become educated, less people will die. Fewer youth will feel as disconnected as they do, and lives can be saved and fulfilling. We encourage people to get involved in their own crisis centers: https://suicidepreventionlifeline.org/our-crisis-centers/ and get trained in Mental Health First Aid. Discussion questions: Does your school have a counselor, psychologist, social worker or other members of support staff? What are their names? Where are their offices located? What does the work of these individuals in your school entail? How could you find out? As a student, are you aware that you may speak to a counselor or social worker? Read this short, helpful article written for students about the role of school counselors. “There is a significant movement to educate people about the National Suicide Prevention Lifeline. This is a network of 160 crisis centers in communities serving some of the highest risk individuals. Crisis centers receive an annual stipend of only $1,500 to answer the Lifeline. All other funding must be found in their local communities. For CrisisLink, our budget is less than 1 million dollars, and we are serving most of the state of Virginia. We are not unique to this problem. The Lifeline number is being shared, but sometimes, people wait for longer than 20 minutes to speak to someone. The less able the local center is to answer, the longer the wait time is for the person in crisis. Currently, the National Suicide Hotline Improvement Act is forcing research on the feasibility of changing the Lifeline to an n-1-1 number for mental health crisis. This would expand the reach of the number and hopefully increase funding for states, but it’s still far away. Now, more than ever, we need more people trained and more people working towards answering this number so that when a child, or anyone calls, it’s answered. Discussion questions: How much has your state allocated to mental health services? Look at the budgets for mental health at the local and state level. Read your local or regional newspaper to see what articles have been written on this issue. You may also want to take a look at how state and federal funding for mental health services work by reading this brief article, The Federal and State Role in Mental Health. 4. Complete Extra’s daily news lesson How the news, Netflix and social media play a role in how schools talk about suicide based on the role the media plays on this subject.